Rahel is a recipient of the honorable Shem Tov Award for dedication and commitment in strengthening the New Hampshire Jewish Community. She is a juried artist of the NH Council of the Arts, the New England Foundation for the Arts (NEFA) and a New England State Touring Artist (NEST), and a member of the NH Jewish Artist Connection. Rahel is the creator, co-producer & co-host of the radio program /educational resource and website, Israel is Real. Rahel shares her time performing and working as a Songleader/Cantorial Soloist assisting Rabbis in worship. 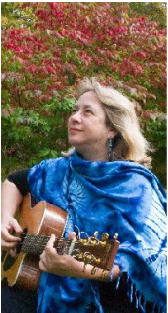 Together with Rabbi Louis Rieser she created a unique Shabbat musical and meditative service based on the music of "Tikkun" (upload available below). She worked as Principal at Congregation Betenu's religious school, where she also taught Music, Hebrew & Jewish Studies, and at many synagogues around New England. Rahel appears often at CAJE, LIMMUD, and regularly at the National Havurah Committee. Since 2004, Rahel has worked as a Music Practitioner using music as a unique and powerful form of energy medicine that supports mind-body-spirit healing, transformation and transition. More recently she has become immersed in the study of Torah-based healing in theory and practice which supports her beautiful musical work.